This type of kitchen setting represents the level of thought and creativity that can come out of anybody’s mind. The kitchen has been provided with numerous little wooden cabinets, finished with contemporary look and feel. 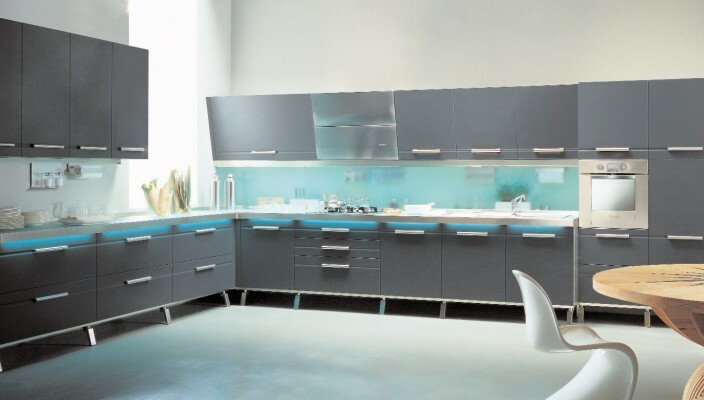 These cabinets have been arranged in an aesthetic sequence, which covers a considerable portion of the kitchen wall. The floor mounted cabinets and the wall mounted cabinets, both, are displaying the fact that excessive elements can also be arranged in a tidy looking way. The color scheme that has been used on the cabinets and shelves belongs to the grayish side and that is perfectly matching up to the other light color schemes that have been used on the floor, ceiling and walls. All the basic appliances and accessories have been provided and fixed in the optimal space provided in the kitchen arrangement. The kitchen setting is projecting a clean and neat look due to the carefully arranged cabinets and shelves in a proper sequence.